You are here: Home / Featured / Generation Hope Overview & History! Generation Hope Overview & History! Spilling out of ‘The Five Lights‘, Kieron Gillen was tasked with writing the short-lived Generation Hope series. 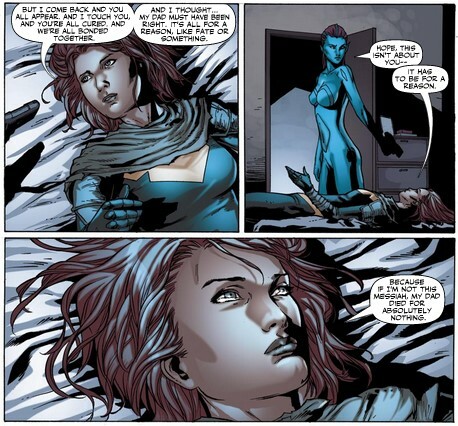 Always suspecting his run would only last a year, Gillen had the responsibility of fleshing out the character of Hope Summers and the other Lights, and he made every issue an exploration of the characters. Under Gillen’s pen, Hope interacted with her Lights and learned what it meant to be the Mutant Messiah. ‘Schism‘ changed everything for Generation Hope. Gillen penned two tie-in issues – the only ‘Schism‘ tie-ins – and James Asmus took over for another five issues. He built up the series to a climax, with Kenji playing the role of Judas for this particular Mutant Messiah, and closed the book off on a high point. ‘The Future is a Four-Letter Word’ (#1-4): Kenji, last of the Lights, manifests and wreaks havoc in Tokyo; Hope must work to bring him under her sway. ‘The Daddy Issue’ (#5): A character piece, exploring Generation Hope’s interaction with the other Utopia residents, specifically Magneto, Xavier, Emma Frost and Cyclops; with a bonus presence from the Beast. ‘The Ward’ (#6-8): A new Light shines – a foetus, causing no end of chaos as its powers flare out. 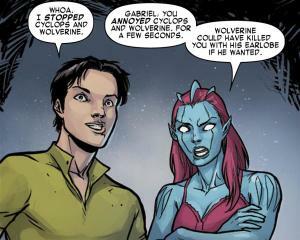 Upon return to Utopia, Primal’s parents take the X-Men to court attempting to reclaim custody. ‘Better’ (#9): A tragic issue, with a new Light shining – and committing suicide. ‘Schism’ (#10-11): A two-part storyline focusing in upon Idie’s part in Schism. ‘Half as Bright’ (#12): A character issue exploring the consequences of Schism, pulling the threads of Gillen’s run to a conclusion. ‘Regenesis’ (#13-17): Asmus takes over to mix things up, with Sebastian Shaw, Martha, and Pixie added to the mix. It culminates in a confrontation with Kenji in which he betrays Hope and attempts to kill her. This time round, I’m going to look in on three of the major cast in Generation Hope. Hope reflects on what it means to be the Mutant Messiah. Understandably, Hope is a central character. Both Gillen and Asmus were fascinated with the character, and Gillen deliberately kept Hope slightly more distant. His Hope embraced her destiny as Mutant Messiah, but in #12 we learned this was in a sense an attempt to find meaning behind Cable’s death; her father had died believing she was the Mutant Messiah, and so she was determined to be so. She couldn’t handle the idea that her father died for nothing. Unfortunately, the character of Hope was perhaps done a little too subtly; few readers immediately understood the way Gillen and then Asmus were portraying a character who was locked deep in grief. Deliberately created to be rather derivative, in that he defined himself by the art he had known, Kenji was Gillen’s own creation in the series. Kenji was bitter and conflicted by his new mutanthood, and under Asmus’ pen ultimately betrayed Hope. Kenji died for his treachery, a shame as he had potential to develop into an unusually enjoyable villain. Laurie, sometimes known as Transonic, played the crucial role of commentator. She questioned and debated in a manner that both Gillen and Asmus used to tremendously positive effect, highlighting the curious and ominous nature of the Mutant Messiah in her words. Again, I feel that she has tremendous potential, as I discussed over on Mahmusecomics! In a sense, there are few series that are so embedded in the x-continuity of the time; from the outset of his run, Gillen was well aware that he had been passed the baton of some important characters. Hope’s life was designed as an arrow, aimed straight at the events of AvX, and Generation Hope is the story of the arrow’s journey. Spinning out of ‘The Five Lights‘, the book tied in to ‘Schism‘ and was transformed by the events of ‘Regenesis‘. It closed down shortly before the events of ‘AvX‘. The short-lived Generation Hope series is essential reading to really understanding the character of Hope, the essential figure in the Mutant Messiah arc. Gillen fleshes out some basic characters introduced by Fraction, firmly establishing the book as a character study, and Asmus brings it to a satisfactory conclusion.